Crest Glamorous White also known as Crest Advanced Vivid can give you that Hollywood smile in as little as 14 days. Please note that 20 strips = 10 treatments. Each pouch contains 2 x strips. Whitens teeth 25X better than a leading whitening toothpaste. Think your whitening toothpaste is giving you the whitest smile you can get? Think again. Imagine dialing up your dazzling, whiter smile 25X better than a leading whitening toothpaste can. Now stop imagining and make it happen, with Crest 3D White Luxe Whitestrips Glamorous White. Their no-slip grip means the strips stay put until you take them off, allowing you to talk and even drink water while whitening your teeth. Using them just once a day for 30 minutes elevates your whiter smile to the next level. Think your whitening toothpaste is giving you the whitest smile you can get? Think again. Imagine dialing up your dazzling, whiter smile 25X better than a leading whitening toothpaste can. 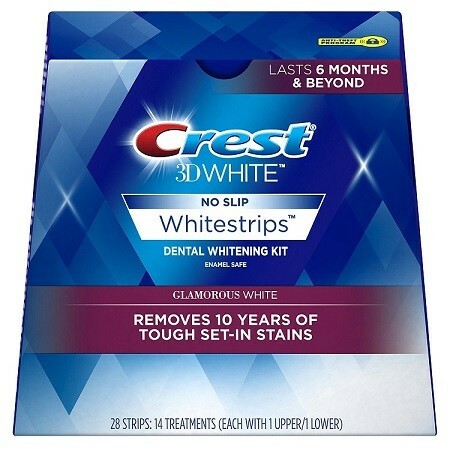 Now stop imagining and make it happen, with Crest 3D White Luxe Whitestrips Glamorous White. Advance Seal Technology helps the strip to mold to the unique shape of your teeth and also come off cleanly and easily. Their no-slip grip means the strips stay put until you take them off, allowing you to talk and even drink water while whitening your teeth. Using them just once a day for 30 minutes elevates your whiter smile to the next level.